Qualification for Law Enforcement demands high standards. 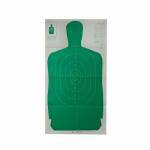 These B27 shooting targets are great for practicing for law enforcement tests or just for self defense / home defense practice. Features high contrast green silhouette, scoring area and LE approved scoring rings. High contrast green for instant shot placement recognition Scoring table for keeping track of performance and rounds Available in either standard paper or cardboard backing options Repair center covers previous shots..
Champion Scorekeeper paper targets feature bright fluorescent colors to make it easier to pick out your mark and know where you hit. Built-in record keeping section helps you track data to refine your loads and zero-in on tight groups. 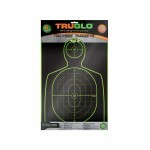 100 yard rifle targets feature fluorescent orange & green bullseye, sold in 12pack. ..
Champion Scorekeeper paper targets feature bright fluorescent colors to make it easier to pick out your mark and know where you hit. Built-in record keeping section helps you track data to refine your loads and zero-in on tight groups. 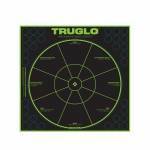 50 yard small bore targets with fluorescent orange & green bullseye, sold in 12pack. 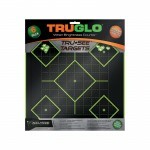 ..
Champion VisiColor high-visibility targets offer an interactive, fun and useful way to sight in and practice. VisiColor provides multi-colored impact halos for easy identification of specific hit locations. 5" double bullseyes, sold in packs of ten. 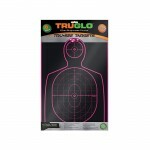 ..
Champion VisiColor high-visibility targets offer an interactive, fun and useful way to sight in and practice. VisiColor provides multi-colored impact halos for easy identification of specific hit locations. 5" double bullseye with 4 extra bulls in the corners. 8" target, sold in packs of ten. .. Ideal for shotguns, handguns, rifles, muzzleloaders, airsoft guns and crossbows. Point-of-impact visibility is enhanced by a fluorescent green or pink halo. Flat finish with fluorescent green or pink background is easy to see downrange. Self-adhesive replacement dots extend target life (Not available on Turkey target). Shoot target as is or peel-and-stick the target to your favorite backstop. Shot groupings are easy to see downrange. Printed on heavy stock paper with a self-adhesi.. Ideal for shotguns, handguns, rifles, muzzleloaders, airsoft guns and crossbows. Point-of-impact visibility is enhanced by a fluorescent green halo. Flat finish with fluorescent green or pink background is easy to see downrange. 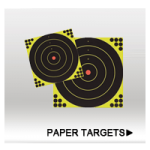 Self-adhesive replacement dots extend target life. Shoot target as is or peel-and-stick the target to your favorite backstop. Shot groupings are easy to see downrange. Printed on heavy stock paper with a self-adhesive backing for increased target life. .. Capture the same Shoot-N-C experience in Black and White. 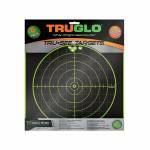 Great for use as an indoor target. Wihte face with black markings when hit. Includes repair pasters, so you can use the same target over and over again. 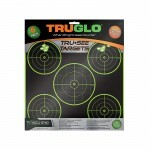 8" diameter 6 pack 72 repair pasters ..
Self-adhesive target sticks to almost any surface Point-of-impact is highlightd by a fluorescent green halo High visibility fluorescent green outlines are easy to see downrange Diagnose and fix common grip and trigger errors to shoot with proper form and improve your accuracy and consistency Self-adhesive replacement dots extend target life Shoot target as is or peel-and-stick the target to your favorite backstop Shot groupings are easy to see downrange 6 Targets 204 Replaceme..